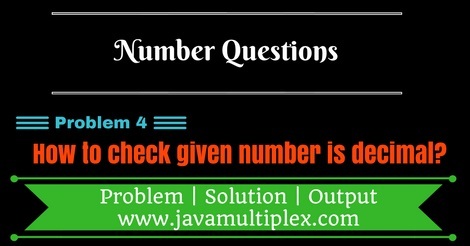 Home Basic Number Questions How to check whether given number is Decimal or not in Java? Write a program in java that checks whether given number is Decimal or not? Do all possible validations also. Given number is decimal or not? A decimal number is a number that is represented using ten distinct symbols 0-9 where these symbols represent values zero to nine. Output - Given number is decimal. Output - Given number is not decimal. Tags : Decimal numbers, Solution in Java, Regular expressions, String, if else statement.